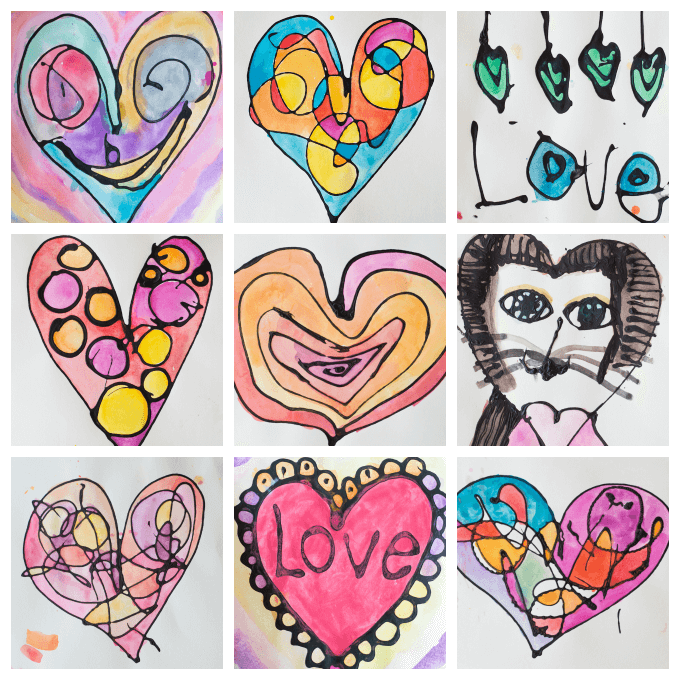 Learn how to make faux stained glass valentines with black glue and watercolors. The kids and I made faux stained glass valentines this past week with black glue and watercolors. Maia and I did a similar project when she was around preschool age, I think. Then I kind of forgot about the whole idea. It was one of those ideas that we found online and only tried once, despite it being successful. For some reason I checked it off in my head as “done” and we never revisited it, even though there are so many different ways to approach it. But this time, we did actually revisit the faux stained glass technique and I’m so glad we did. We all had fun with it! The basic idea is to mix white school glue with enough black acrylic paint to color it. Squeeze out a glue design onto heavy paper and let it dry, then paint with watercolor paints. The black glue acts as the “lead” in the stained glass and keeps the paint colors separate in the finished artwork. Here’s how to do this activity, with step-by-step photos and instructions. First, make your black glue. Open the top of your half-empty bottle of white glue. * Add a good squeeze of black acrylic paint to the bottle and, if you’re slightly unsure of how well they will mix together, add a touch of water, too. If you have a more liquid-y craft acrylic paint, skip the water. Screw the top of the glue bottle back on tightly and shake well to mix. *A note on glues :: We used Elmer’s white school glue. I think you could easily use other brands and other white glues. For those of you in the UK, I hear that PVA is what you want to use. Next, squeeze out a glue design onto watercolor paper. You can do this with any sort of image, scene, or abstract art. We used the technique to create hearts for Valentine’s Day. Allow glue to dry completely. Overnight worked for us. The black glue will flatten somewhat as it dries and that’s okay. The kids are on another school delay and are painting the black glue Valentine designs from yesterday. I love how they are turning out! Finally, paint your heart art or other glue design with watercolor paints. You can use either watercolor cakes in tins*, as we did, or liquid watercolor paints. The black glue looks like the lead in real stained glass windows and also helps to keep the colors separate in the finished painting. Neat, huh? I especially like how these scribble art hearts look! Ready to try this? You probably have everything you need, already, except perhaps the black acrylic paint which you can pick up at the craft store. And if you want some more stained glass art ideas, here’s a post on 16 Faux Stained Glass Crafts for Kids on Buggy and Buddy. Hi Jean, thank you for the great idea! Do you think black tempura paint would work? Hi Jean, it works!! I did the half and half mixture in the bottle and it came out great! Drying time was only about a few hours……I wasn’t watching closely. Depending on how thick the glue was squeezed was how flat it came out and I don’t have the other to compare to but so happy as I have lots of black tempura paint. As I was doing it I was thinking that would be a great post, 10 ways to use black tempura paint (or something). Not that you need any ideas! Thanks again!! Awesome!! That’s wonderful, Dena! Now I want to try it… :) It sounds like you used as much paint as glue, right? I did. But I’d like to add a couple of things now that we have painted several of them. In a couple of spots where the black glue was really clumpy, if too much water color painted over it, then the glue softened up a bit; this was only temporary and very minor. I don’t know if this happens with the acrylic paint since it’s permanent. Also, the water color paper buckled but was fixed with a stack of books. I love this idea! I have pinned this so that I can do this with my grandkids. I think that they would have loads of fun doing this activity! Wonderful, Nina! Hope you and your grandkids enjoy it! We need to do this again – the kids always love this! Thanks for the reminder. What kind of art display line is that in your studio? Do you know which grade level is this most appropriate for? THank you so much for this project. I’m going to do this with my kids today. Your work is appreciated. ? Can you use tempera paint instead of acrylic? It would probably work fine, Norene. Acrylic is waterproof and tempera will dissolve in water, so using the wet watercolor paint next to the black glue lines might have some effect on the art if you use tempera paint.